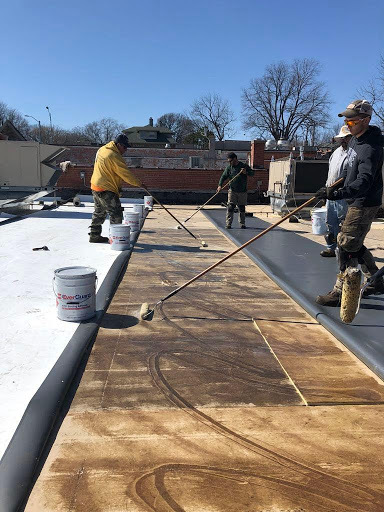 Commercial roofing is more expensive, complex and vulnerable than its residential counterpart, and the team at Easton Roofing understands this well. Since 2013, we’ve been working with Kansas City area business owners to ensure their staff, inventory and investment is safe and protected. Easton Roofing exclusively installs GAF commercial roofing products. Through GAF, we are among a select group of local roofing contractors that are certified in coatings and single-ply roofing installations. What does this mean for you? Your business is in proven hands with our commercial roofing experts. Commercial roofing tends to be larger in scale than residential roofing, due to the size of most commercial properties. Similarly, commercial roofing demands more maintenance. Proprietors need to be very judicious in investing in the right roofing materials and maintenance solutions to get the most out of their investment. Aside from providing roof replacement and repair, we also help clients looking to increase the energy efficiency of their buildings using roofing materials. Our experts are knowledgeable in the different types of commercial roofing, and know which options would best yield favorable energy efficiency ratings and lower energy costs. We have the skills, certifications and equipment to reliably install and repair commercial roofing on any business establishment, whether it is a large office building or a small restaurant. A free, no-obligation consultation regarding the state of your roofing, what needs to be done and how much it will cost. An accommodating customer service experience enhanced by our manufacturer and labor warranties. Careful analysis and thorough assessments of your roofing system before and after our services. Roofing repair or replacement solutions that take into consideration your needs, energy efficiency concerns and budget. Easton Roofing is the roofing contractor Kansas City business owners trust. Call us today at (913) 257-5426 in Kansas City or (785) 766-1259 in Lawrence. You can also request a free consultation online.